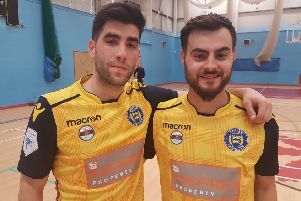 The experienced defender was due to be suspended for the Sussex Intermediate Challenge Cup final against Upper Beeding at Lancing FC this Wednesday night. But after Hollington contacted the Football Association to contest Ray’s ban, it has now been deferred until next season. Ray was sent-off for a comment made to the referee while managing Hastings United under-18s in a recent game and was subsequently handed a two-match suspension from all football until two Hastings under-18 matches have been played. But with the Hastings under-18 team’s season having finished, those two games wouldn’t have been completed until the start of next season in September. That would have meant him missing all of Hollington’s matches during the remainder of this season and the start of next term. Hollington felt it was unfair they should be punished for something which happened at another club and put their case to the FA, which has now pushed the suspension back to September. Ray, who sat out Hollington’s top-of-the-table Mid Sussex League Premier Division defeat to Cuckfield Rangers on Saturday April 6 because of the original suspension, will therefore be available for Wednesday night’s cup final. Hollington manager Scott Price feels that common sense has prevailed. Hollington are currently third in the league, with a good chance of finishing second, and have two cup finals coming up in the second half of this month.